High Speed, High Pull, Robust Design, Energy Efﬁcient, Easily Maintained, Long Life, Un-matched Customer Service are synonymous with the Marshall & Williams name. Since its beginning, M&W is well known for building stenters that are both robust and durable under the most adverse conditions. While running the fastest speeds with minimal energy consumption. In 2000, M&W became part of the Navis TubeTex Group. Before the acquisition, they frequently partnered on larger projects. The Series 2000 is the leading M&W chain system. It incorporates over 90 years of tenter chain experience with the latest metal, plastic, manufacturing and lubrication technologies. High temperature engineered plastic chain bushings for longer life than competitive designs. Clip top knife & plate matched using a proprietary process. Power & reduces wear. Spring steel surface designed for life of rails. 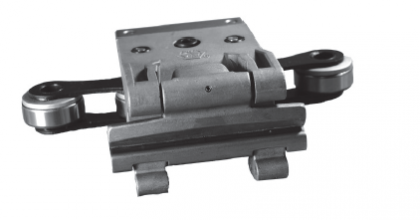 Flexible Spring steel hinges at each joint ensure smooth rail to rail transition. Rail constructed from laser cut plate and extruded shapes. This techniques ensures dimensional stability through years of thermal cycles. This stability prevents pre-mature chain and rail wear. Weight of chain supported by carbon, lubrication free, wear strips. Chain Lube Port patented design allows for grease to be added directly to bearing. 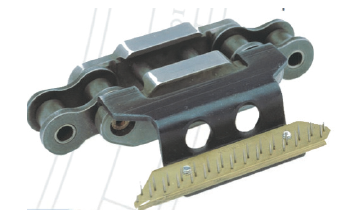 The P5 pin chain is the answer to applications requiring vertical pinning systems. 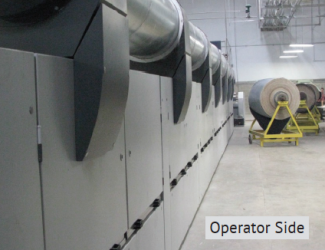 Web control is maintained at even the highest overfeed rates because of the vertical design. The chain is manufactured using a unique power metal technology. Using powder metal gives an extremely straight pin line, precision lubrication passages and a high strength chain. Low Profile design for minimum nozzle to fabric distance. Rail system protects chain and pins on the return path. Formed sheet steel rails prevent oil leakage to floor or surroundings. Hard Aluminum Bronze wear surfaces are designed for the life of the rails. 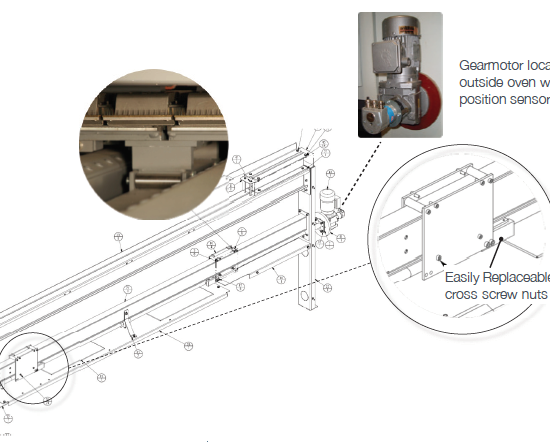 Pneumatically actuated pinning roll for easy set-up. 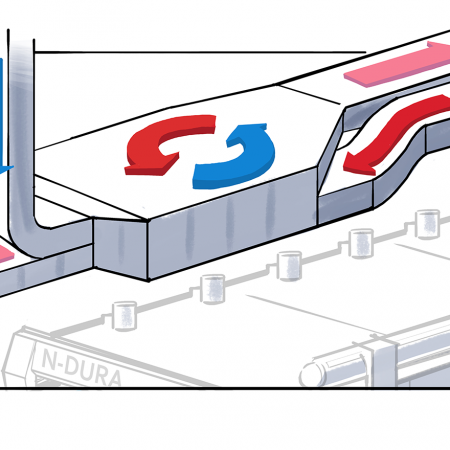 The N-Dura Dryer was developed by engineers using the latest thermal & aerodynamic modeling techniques to optimize air flow patterns and heat distribution; concurrently, industrial designers developed a structure that was easy to install, operate and maintain. Unique Nozzle design using CFD Analysis optimizes velocity and uniformity while minimizing power requirements. Housing losses 43% less than conventional designs. Heat radiation to room is minimized. All wired & piped components (fans, burners, motors, coils) are located on same side of dryer minimizing floor space, providing easy access for cleaning, and facilitating easy installation and troubleshooting. Heat Recovery (internal and stand alone) systems available. Savings are process dependent. Individually removable nozzles with clean-out doors. Large Return air filters cleaned while in operation. Frequency is process dependent. 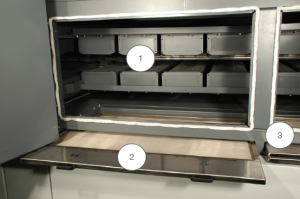 Duplex filters ensure process air is filtered during cleaning. Direct coupled gear motors outside of dryer eliminate maintenance problems with chains and sprockets. Rails positioned to preset width (recipe or operator selectable). Position Sensor displays rail location at each joint and eliminates damage caused by extreme rail angles. 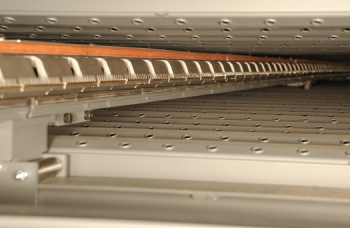 Precision saddles support rails from tipping caused by pull forces and web close to nozzles for efficient heating and drying. Width Adjustment screws below support beam prevent contamination of web. 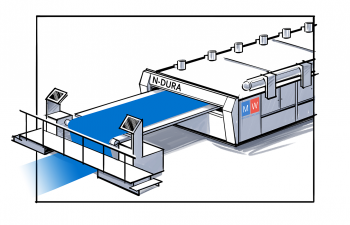 M&W offers both integrated and stand-alone heat recovery systems for the N-Dura Stenter. Payback is often less than 1 year based on processing parameters and utility costs. Typical design returns heated make-up air to the dryer. External systems for heating water or air used elsewhere are available. For exact machine solutions or special processes, contact Navis Global. Our team of technical engineers and process specialists are industry leaders in providing manufacturing solutions.